One of the women who works near me is expecting her third child the end of this month. Now by the time you have 2 and are on your third, most everything is a hand me down. So since I had some baby color yarn, it is a little girl, and I wanted to practice making this hat and the pom pom - I cast it on on Monday and after a couple of false starts, finished it up last night. 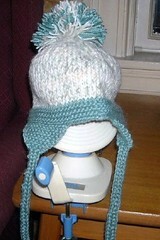 It calls for you to put the ear flaps first but I found it easier to do them after. I also like my decreases better then my increases so it worked out well. Hope she likes it. 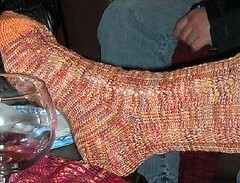 These are the socks that I designed and knit for Kathy for our Spring Swap. They are created in mystery yarn from my mom's stash and because Kathy is always telling me how big her feet are I made the toes a different color. I am proud to say that this pattern is available to purchase at The Yarn and Fiber Company. It is a very easy pattern to memorize but ends up looking more complicated than it is. It is an asymeterical lace panel that also travels down the heel for clog or birk wearing. (Kathy is a huge birky wearing fan). I wanted you to be able to see the pattern. If you decide to pick up a pattern I hope you enjoy knitting it and if you run into any trouble feel free to drop me a line and I will give you some help. There was a great swap on Ravelry – a lace swap – I talked Julie into joining with me and off we went. 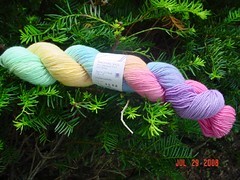 I had a great upstream swap partner by the name of Coloradoknitter who has her own yarn store (CHECK IT OUT!!!). I received some very, very loverly things. Some yummy chocolate chip cookies, a wonderful bees wax candle, mmmm good dark chocolate with raspberries, and yarn, wonderful, wonderful yarn. Some silk and merino, some cashmere (yup that is right folks - CASHMERE) some superwash sock yarn, hand cream and other goodies. I was truly spoiled. It was simply loverly. It arrived right on time, when I needed some fibery goodness to cheer me up. Here it is for you to feast upon. Happy drooling. Last Sat. Mary, Cheryl, David and my mother all met up at the Knit and Crochet show. There was some lovely yarn, nice vendors, cool friends, like Julie, Christine, Crystal and Colin and some FLEECE! Mary had her fleece detector on and found me some lovely merino and silk and some kid mohair. We also found a lovely silk cap for my HHHH pal. I am hopeful that they will like it. It is beautiful colors. The skein here is Lorna's Laces, shepard socks that I am going to use to make a baby hat and some booties for one of the women at work. Here are the other goodies that we walked away with. Oh ya, and my lovely wife took a picture of me crocheting on a blanket for a bear that one of the guilds had at their stand. We also ran into Manise, Kathy and Cheryl. There was a ravelry meet up right in front of my favorite LYS, The Yarn and Fiber Company. It was lots of fun, and I am glad we went. This is the roving that I have been working on getting ready for a swap that I signed up for. I am hoping that this will be thin enough and maybe even enough yardage to make some socks. 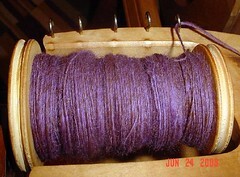 I only have 4 oz but this is 2 ozs spun up and it is an almost full bobbin so we will see. I am going to do it in a two ply with the other 2 ozs. I am pleased at how thin it is coming out. This is the swap that I am in. I found it in Ravelry. Not on Ravelry yet? What are you waiting for? All the cool kids are hanging out there. On Friday we are having a baby shower at work for one of the men (there are only 3) who work in our department. This weekend I whipped up a little rolled brim hat out of some stash Lorna's Laces Sport that I had left over from a scarf I made for my boss for Christmas. It was a simple knit, 70 stitches on size 4 needles. If I have time, I will make some booties as well, but we will see. On Saturday I went to the knitters breakfast at the Fabric Place in Woburn with Kathy, Julie, Cheryl and my mom and then I worked at A.C.Moore doing a scrapbooking crop in the afternoon. It was fun. This is a sock that I am knitting for Mary. It is yarn that she handdyed this summer in her 3 favorite colors. The pattern is k2, p2 for 4 rows, p2, k2 for for rows. It is giving it a cool texture and the yarn is pooling in a very interesting way. 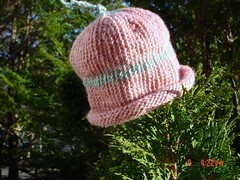 This is a chemo cap that I am knitting for a co-worker. I have started this hat 4 times and have not been happy with the way it was working. I am now knitting a simple 2x2 rib on size 6 needles. The third project that I have on the needles is another sock for the Silly Sock Swap that I am in with some friends. I am really not sure about this pattern. It doesn't seem to be working the right way and I am only on the 2nd row of the chart (yes Christine I am reading it correctly, right to left) but I have some stitches left over - so I need to go back and see what I did wrong - don't know, it might end up in the Frog Pond. And the final picture for today is a completed project that I don't think I ever posted a completed picture of. It is a lace scarf for my boss that I gave her at Christmas time. It is done in Lorna's laces sport weight yarn and was a dream to knit. Have a great Hump Day! ADORABLE - which is what I think my young lady of a daughter is in her first grown-up adventure. One of Kelsie's friends turned 16 over the weekend and her parents arranged for 8 girls to have a limo ride from Methuen to Boston and to drive around Boston a bit and then to have dinner at Fire and Ice. Kelsie said that they had a great time and that the waiter was "intimidatingly hot". She said the food was wonderful and that she was so glad to go. Glad you had a great time honey. Knitting news, I have a new swap that I am participating in - Silly Sock Swap. Small swap with most of the members knowing each other. Look here for updates as I post pictures of the socks as they are knit up. Also, working a sock for DW and a chemo cap for a co-worker. What are you working on? OMG I got it!!!! Of course I got it the other day but have been too busy to do anything about it. What is IT you ask????? My Ravelry Invite of course. I have been very busy uploading some yarn, and some projects to flickr and will over the next few days start playing in Ravelry. My name on both Flickr and Ravelry is Debbi62. Come look me up. This weekend we spent Saturday knitting squares for the miners. Mary saw it posted on one of the blogs so Kathy and I knit up a square and Mary is working on one too. You can check it out here at Flo Knits I also finished another of the Mandy's Candy Bag and it is for a gift.... if you promise not to tell I will show you a pic. These work up really quickly and make great bags for gifts. 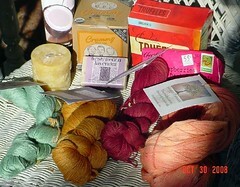 Today after work I needed to go to Hub Mills to pick up some yarn for a swap that I am in. OF course because they close at 4:45, I left work at 3:30 figuring that I would have plenty of time. WRONG!!! There was an accident on Rte 3, and some person &%$#@ was holding the elevator on the 5th floor when I got there sooooooooooooooooo I had exactly 6.5 minutes to look around and pick up what I needed. I was not happy but I was successful!!! Hurray for me. It is off to Ravelry for me...need to figure it out. In anticipation of getting my invitation to Ravelry, I have created my Flickr account and will spend the next few days uploading some pictures. My Flickr name is Debbi62 which I hope I will be able to use on Ravelry as well. Work is going well, the commute is not as bad as I had expected, of course I leave at 6:30 every day but that is ok, my body is adjusting. Have a great night, I am going to wind some yarn.